We Have Two New Listings This Weekend! We're excited to bring you two new listings this week, along with several other great open houses! Please stop by or call us for more information about these wonderful homes, or any other property for sale. Going to the Kingman Island Bluegrass Festival? So are we! We're excited to be sponsoring the Kingman Island Bluegrass Festival this year! If you are going too, stop by our tent to say hello and to pick up a refillable water bottle. We'll have some other goodies as well so be sure to find us! Our tent is just beyond the Bluegrass Stage and across from a water station where you can immediately put your new reusable water bottle to use. If you've never heard of the Kingman Island Bluegrass Festival, it's time to catch up! Kingman Island is located on the Anacostia River near the RFK Stadium. It was originally created by the Army Corps of Engineers in 1916, and is now managed by Living Classrooms, which has transformed it into a recreational area for people of all ages to learn about the natural environment. Imagine drinking your morning coffee on a front porch overlooking a large garden, right in the heart of the Northeast side of Capitol Hill. 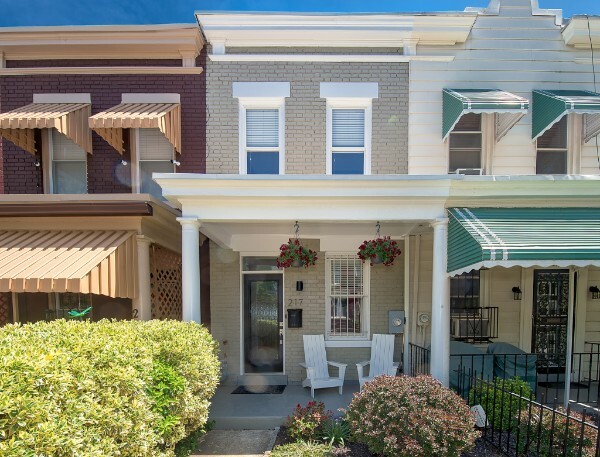 Located just two blocks to Lincoln Park and a short stroll to H Street’s retail and restaurants, the location of this week’s featured listing couldn’t be better. This lovely home at 217 14th Place NE welcomes you and your guests with hardwood floors, exposed brick walls, and a large gas fireplace. The open kitchen with granite countertops is flanked by a spacious dining area and glass-paned door to the back yard. A half-bath is cleverly tucked under the staircase, rounding out the first level. The Renovation Extravaganza is Just A Week Away! RSVP Today! Two Great Listings in The Car Barn! Your chance to live in one of the most coveted condos complexes on the Hill is here. You know the one we are talking about: the beautiful Historic Car Barn, rated by Forbes as one of the top gated communities in the U.S. The historic Romanesque Revival-style building was redeveloped in 2004 and transformed into a fabulous community with 196 condos, a beautiful interior courtyard, an outdoor swimming pool, bike storage, and parking. And sitting just off of Lincoln Park, the location is hard to beat. There are a lot of reasons this place is so popular. And we have not one, but TWO condos on the market there! Three New Listings And Lots Of Open Houses This Weekend! We're excited to bring you THREE new listings this week, along with several other great open houses! Please stop by or call us for more information about these wonderful homes, or any other property for sale. If you are a homeowner who is expecting a tax return, you’re likely thinking about ways to put it back into your house. But what projects will get you the biggest return on your investment when you are preparing to sell your home? We recommend starting small. Often times, the “touch up” items on your list are the ones that can make the biggest impact for the smallest cost. For example, replacing your entry door will instantly transform the way you and others feel welcomed into your home.